The Hanalei Colony Resort offers the paradise many search for in Hawaii. "Unspoiled ... unplugged ... unforgettable," the brochure read. "The sweep of Hanalei Bay with its backdrop of fluted emerald peaks and cascading waterfalls is the stuff dreams and movies are made of ('South Pacific' and 'Jurassic Park,' to name a few). » Rates: Start at $240 per night. Ask about packages, specials and kamaaina rates. » Notes: Forty-eight vacation condominium units have two bedrooms, one-and-a-half or two bathrooms, a fully equipped kitchen, living room, dining area and lanai. Amenities include a swimming pool, Jacuzzi, and barbecue and picnic areas. A complimentary afternoon mai tai party and all-you-can-eat continental breakfast are offered weekly. An optional lei-making class (nominal fee) follows breakfast. Wireless Internet access, two computers for guests' use and a lending library of books, toys, puzzles and games also are available free. » Beach and Botany Package: The Beach & Botany Package includes five or seven nights in an ocean-view or premium oceanfront condominium, gourmet picnic lunch, one-day kayak rental for two on the Hanalei River, beachside massages for two, a welcome basket of gifts for gardeners and two annual memberships to the National Tropical Botanical Garden (www.ntbg.org), of which Limahuli Garden and Preserve is a part. Each guest must make a minimum commitment of a four-hour work session on two different days at Limahuli. They can choose the activity that best suits them, ranging from taking inventory and potting plants in the nursery to hiking an unpaved trail to weed and plant trees. Volunteers must be at least 14 years old. Prices begin at $1,994.85, double occupancy, for five nights in an ocean-view unit during low season (Sept. 9 to Dec. 19). "Enjoy the splendid views of the Hanalei Valley lookout and National Wildlife Refuge -- a little further on is Haena State Park located in the shadow of the ancient Ka Ula A Paoa Heiau -- the temple of the hula goddess. "It's here that we've created a tranquil lodging environment built with a sensitivity to the unique character of its surroundings." 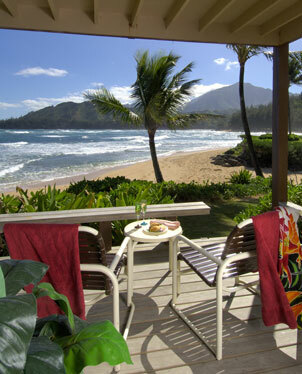 To my boyfriend Rick and me, Hanalei Colony Resort sounded like the ideal escape. Constantly on the go with high-stress jobs, we decided it was time to make time for ourselves in Haena. North Kauai looked radiant in the summer light. Each time we crossed a one-lane bridge (seven in all between Princeville and Haena), we felt we were getting farther away from our hectic daily lives and closer to what Hawaii was like when the air was filled with the songs of birds rather than the cacophony of crowds and traffic. 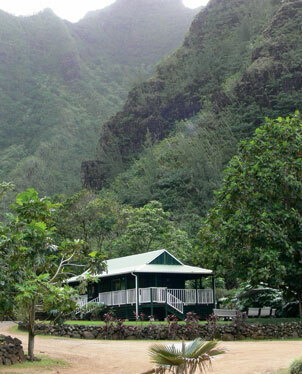 Haena is the gateway to the storied Na Pali coast, 15 miles of magnificent wilderness. Hanalei Colony Resort sits oceanfront in this pocket of paradise, with expansive lawns, trees and shrubbery skirting each of its 13 two-story buildings. Our accommodations were clean, comfortable and gloriously unpretentious. Feeling right at home, we kicked off our shoes for a walk on the beach. Ten steps and we were there. I'd forgotten how rejuvenating cool breezes, salt water and sand could be. We awoke early the next morning and made the 10-minute drive to Kee Beach, where the paved road ends and the soaring cliffs of Na Pali begin. It was empty save for a lone paddler ankle-deep in the water, ready to launch his kayak. Sun, surf, sand and sky surrounded us. We stayed for a while, relishing the peace and beauty. Limahuli Garden with the visitor center fronting Mt. Makana. Hanalei Colony Resort makes it easy to "unplug"; none of its condominiums have televisions, stereos or phones. Our Beach and Botany package (see sidebar) kept us happily in vacation mode our entire stay. Key components of this brand-new "voluntourism" program are shoulder-to-shoulder work sessions with the caretakers of Limahuli Garden and Preserve, less than two miles from the resort. Not at all joyless toil, these visits are inspiring learning opportunities in a spectacular oasis. Seventeen of Limahuli's acres comprise a "garden" of ancient taro patches and culturally significant plants, including many of the "canoe plants" brought to Hawaii by the first Polynesians for use as food, medicine, clothing, shelter and tools. Limahuli's "preserve" is a 990-acre blanket of untamed greenery, some of it alien species that are pretty but so aggressive they are overwhelming native vegetation. A major effort is under way to eradicate the aliens and re-establish the natives. With young, 2-foot-high kului shrubs cradled in our arms, Rick and I joined four of Limahuli's staffers on a half-mile hike to a clearing in the preserve designated for such restoration work. We weeded, removed rocks and chose the spot for "our" plants to take root. It felt good being in touch with the earth and out of touch with life as we normally knew it. Back at the resort, we unplugged even more with lomilomi massages performed outdoors in a thatched-roof hale by therapists from the on-site Hanalei Day Spa. Owner Darci Frankel is a skilled Ayurveda practitioner who offers traditional Abhyanga warm oil massages, Utvartana body wraps and Shirodhara treatments on her menu of therapeutic services. Although it wasn't part of our package, dinner at Imad and Yarrow Beydoun's Mediterranean Gourmet restaurant, also on property, was another delightful indulgence. Every table has an ocean view that will capture your attention; unless, of course, the Beydouns have booked a belly dancer for the evening's entertainment. Stuffed grape leaves, gyros, falafel and lamb kabobs are among the house specialties, but options also include perennial favorites such as chicken marsala, T-bone steak and grilled fresh fish of the day. Imad's coconut baklava is a must for dessert. After dinner, the beach beckoned. We sat there with bare feet and breeze-tousled hair, mostly in contented silence. It was relaxing and romantic and, yes, definitely unforgettable. We would be back to reality soon enough. There on the cool sand with stars twinkling overhead and waves dancing at our toes, we just wanted to linger in the dream.